BLURB FOR TOTAL PROP MAILER................ Total Propaganda moves the study of propaganda out of the exclusive realm of world politics into the more inclusive study of popular culture, media, and politics. All the participatory functioning elements of the society are aspects of membership in the popular culture. Thus, the values of popular music, media, politics, debates over social issues, and even international trade become everyday propaganda to which everyone may relate. To emphasize the necessity for new thinking about propaganda, Edelstein creates the concepts of the new propaganda and the old, and he devises a language of "uninyms" to convey their meanings more quickly. "Oldprop" is characteristic of mass cultures and utilizes totalitarian methods of conflict, hegemony, minimization, demonization, and exclusiveness to achieve its goals. By contrast, "newprop" is created by members of the popular culture to allow them to engage in accomodation, enhance the individual, and promote inclusiveness. Shifts in the old and the new propaganda are tracked across social issues such as race, religion, sexuality, gender, gun control, and the environment, as well as in fashion, politics, advertising, sports, media, and politics. Central to the concept of total propaganda is that it is not simply additive; it is the product of new energies that are produced by the fusing of propaganda in such related forums as music, art, advertising, sports and politics. It is these synergies, and their production of new energies, that make total propaganda greater than the sum of its parts. Edelstein concludes that the most important distinction that should be drawn between mass culture and popular culture is its text; i.e., its propaganda. In a popular culture, everyone creates and consumes propaganda; in a mass culture almost everyone consumes it but only a few create it. This formulation offers new ways to discuss power and ideology in media texts. As an example, where once the least informed and the least educated were the most subject to propaganda, now the most informed and most educated often are the first to create propaganda and the first to consume it. FORMER BLURB COPY.......It is widely recognized that the mass media provide us with ample information which we use to construct some sense of the world around us. It is not as widely recognized that consumers of media messages are active in this constructive process, making meanings that are sensible to them in particular life circumstances. The media target a younger, more media savvy generation who are more likely to be participants in the messages than members of any previous generation. This participatory aspect of new media is central to what the author defines as the new propaganda. Although critical and cultural theories are often prohibitive for undergraduate students, the author's formulation offers an accessible way to discuss power and ideology in media texts. Without using the critical discourse, he provides compelling arguments that power and ideology are created and maintained through the active participation of audience members. The conceptualization of the old and new propagandas helps move the study of propaganda out of the realm of world politics into the study of popular culture. The author views all of the participatory functioning of the society as aspects of membership in a more embracing popular culture. This point of view recognizes that the mass media are extremely important forces in the consumer's construction of reality and that they are no longer exclusive channels for disseminating the messages of the powerful elites. Instead, the media -- particularly the new media -- are accessible to and used frequently by less powerful members of society -- children, ethnic minorities, and marginal members of society -- to create realities that more satisfactorily fulfill their needs. NEW BLURB COPY FOR GENERAL CATALOGS... Total Propaganda is a fresh answer to the question of the inclusiveness of the popular culture. It demonstrates how the values of popular music, media, politics, debates over social issues, and international trade have become everyday propaganda to which everyone relates in some way. Edelstein demonstrates that the most important distinction that can be drawn between mass culture and popular culture is its text (i.e., its propaganda). In a popular culture, everyone creates and consumes propaganda, whereas in a mass culture, almost everyone consumes but only a few create it. This book presents a new language of propaganda that makes it possible to draw comparisons between mass and popular cultures. The language is used to observe shifts in propaganda across various social issues -- race, religion, sexuality, gender, gun control, the environment, print and broadcast media, new technologies, and politics. It also examines fashion, advertising, sports, and lobbying. Total Propaganda is not defined only quantitatively; it mirrors the synergies that have come about in every social and political realm and the energies that these synergies produce. As such, the sum of total propaganda is greater than the sum of its parts. Contents: K.E. Heintz-Knowles, Foreword: Popular Culture and the New Propaganda. Part I:Framing Totalprop: The Old Propaganda and the New. 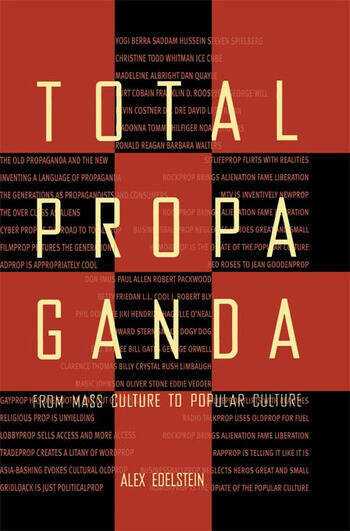 Totalprop: From Mass Culture to Popular Culture, the Old Propaganda and the New. Definitionprop: Distinguishing the Old Propaganda From the New. Languageprop: Inventing the Uninym. Multiprop: Generation and Class. Cyberprop: The Path to Totalprop. Part II:Entertainmentprop: Surprisingly Newprop. Filmprop: Picturing the Generations. Adprop: Appropriately Cool! Sitlifeprop: Flirting With Realities. MTVprop: Inventively Newprop. RockProp: Alienation, Fame, and Liberation. Rapprop: Telling It Like It Is. Sportsprop: Businessball and Heroes Great and Small. Humorprop: Opiate of the Popular Culture. Part III:Mediaprop: From Broadcasting to Journalistic Nirvanas. Radio Talkprop: Using Oldprop for Fuel. TVprop: From Talk to Infotainment. Mediaprop: Shooting the TV Messenger. Journalismprop: Searching for Nirvanas. Part IV:Socialprop: Issues Seeking Answers. Gayprop: One Foot In, One Out. Genderprop: Women in Mid-Passage. Trinityprop: Race, Abortion, and Religion. Lobbyprop: The NRA and the Environment. Part V:Tradeprop and Politicalprop: The Production of Lexicons. Tradeprop: "Naftoids" and a Vision of GATT. Asia-Bashing, A Cultural Oldprop. Politicalprop 1992: Gridlock and Credibility. Politicalprop 1994 and 1995: Restoring Presidentialprop. The 1996 Campaign: Softprop and Hardprop. Pollprop: Court of Last Resort. Endprop: The Road Ahead. "Total Propaganda offers the reader a nearly total look at U.S. popular culture in the 1990s. Total Propaganda merits the attention of those involved in public relations education." "...the book makes fascinating reading mainly because of the author's imaginative and thoughtful references to entertainment, media and some critical social issues, and actors....will offer a pleasant challenge to those who are willing to stretch their definitional horizons and share Edelstein's view that propaganda in our time and place is as ubiquitous as culture." USE FIRST THREE TESTIMONIALS ONLY FOR GENERAL CATALOGS... "A most engaging commentator on public affairs television, Professor Edelstein brings that same quality of mind to the analysis of Total Propaganda." "...offers internationalists who are caught up in the old propagandas of war and conflict fresh approaches to new propagandas in modern states." "The always inventive author provides a cornucopia of ideas and insights about politics and communication as he deconstructs the old propaganda paradigm and illuminates the new." "Political scientists and Asia specialists will appreciate the creative approach to the analysis of propaganda with respect to trade and politics." "Total Propaganda is for students and about them. My students are excited about the concept of the new propaganda." "The author's distinction between the old and the new propagandas redirects us to old and new forms of media criticism and old and new media effects." "The conceptual distinction between the old and the new propaganda gives us much to think about and is worthy of empirical exploration." "A fresh, creative, and original look at politics, popular culture, and propaganda. Important reading for the end of this century and the beginning of the next." "...pushes out the boundaries of the study of propaganda in the popular culture in understandable, creative, and contemporary ways." "Total Propaganda offers us a fresh and intriguing mix of the new propaganda, politics, and the media."